Easy to use. Does what it says. Very straightforward functional app. Doesn’t harass the user. I use this app for a lot of my training, and it works really great. Works well & easy to format! I have been using the free version of this app for years and upgraded to the paid when their ads got annoying. This is a great app and well worth the price. I love it! This app is my friend! I used this app every day for my fitness classes! This app is fairly easy to use. I can set up an endless variety of circuit programs for my classes and clients. Love being able to create my own intervals. I use it everyday. I love the app. But not the screen color! Can't figure out if I can change it. Great flexibility for interval training. Works well with Music in the iPhone. Visually it’s great, as you can set down your phone across the room and see when sets and test periods begin and end. Fantastic app! I’ve used this for years now and provides great flexibility with creating timers for my HIIT and interval workouts! Love the features. Use it everyday. I use the pro for timed exercises and it's great. Highly recommend. I have used this app for many years for stretch/yoga/Pilates timing and have never had any problems. Perfect for Galloway Method Runners!!! Love this app. I am a marathon runner who trains with the Galloway Run-walk-run method. I used this app to create all the specific intervals I need for workouts and races. It works seamlessly with my music, audible books, and podcasts. Also great to use for yoga and stretching to help with holding poses for the right amount of time. Indispensable for my training!!!! Easy, reliable, and customizable. It has helped me take my running to the next level. 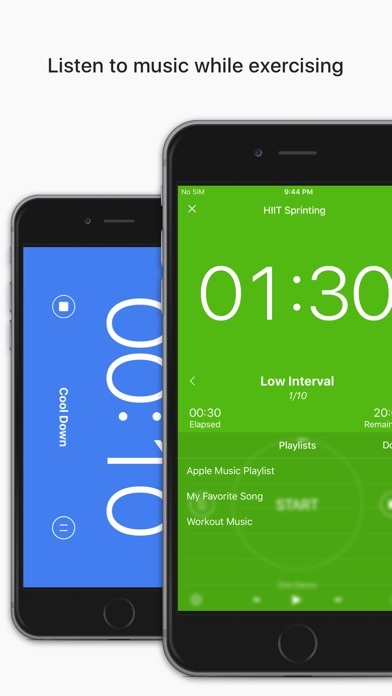 I use Interval Timer for my martial art and Yoga practices. I can set up entire flow sequences and concentration periods in fairly elaborate routines. Some ways in which it could be improved would be the ability to enter various portions of a routine without having to start the entire portion over if interrupted. You can pause, but if you just want to back up a set or two, you have to edit or just begin from the top which can be time consuming and inefficient. But overall it's a fairly decent app. Love this simple app! Use it in the gym for cardio and now that it’s summer to ease myself back into running- I’ve set jog/walk intervals that are moving towards weaning off the walking all together. Awesome app I can’t wait for I watch support! Great app, the major downside is that your history doesn't transfer when you upgrade to pro, and also can't add them myself through the calendar. Great app works for me. The music stops playing on third party apps once the timer goes off with 5is new update. I downloaded the pro version thinking that it would give me the rest time function to recover in between sets. Still not possible. I’d like a refund. The seconds interval timer seems like a better bet. More expensive but it works! I really enjoy this app, when I stick to it lol! Easy to customize - works well for me and makes me feel accomplished. Updated version is not as responsive as previous version. This has plenty of very useful workouts. What I really love is the customization. I can make my own program look and sound just the way I want. Thank you! Easy to set up and use, well designed and flexible, it’s reasonably priced for such a useful app. It works, but could be better. This app really needs to give you more options for configuring your workout. For example, you cannot change the order of a routine without re-doing it from scratch. I LOVE this app. I mostly do jumprope/boxing style cardio and having a good interval timer is key! The only reason I’ve given it 4 instead of 5 stars is because I would REALLY love to be able to use this app on my Apple watch! It really breaks my concentration to have to fish out and unlock my phone whenever I need to pause the session or change my music. Add an Apple watch feature and this will be the best interval app period! Thanks! Don’t pay for the Upgraded version. I wish I had done more research before purchasing the upgrade. There is no difference- was hoping for a countdown feature...or anything. Waste of 3 bucks. Don’t do it! Efficient, utilitarian, perfect. I didn’t need the pro version, but upgraded because this app developer earned it. Generally very solid and flexible app. Finally able to play shuffled playlists! I find the simple timing routines are plenty flexible for my needs, but there are more complex possibilities for specialized purposes. Little difficult setting up, but awesome for interval training. I used the free version for several years and liked it so much I payed for the full version to say thanks for a great product. Only app I have found like it. Super useful and customizable interval timer and plays music. Perfect! I really dig this app. Easy to use-keeps ya on track with your workout and fine tuned very nicely. Must have for those unmotivated days! Customizable. Easy to use. I have a library for the exercise formats I lead. Please consider adding a sound effect as the timer countdowns from 3-5 seconds. I like to work with the participants and cue the countdown. 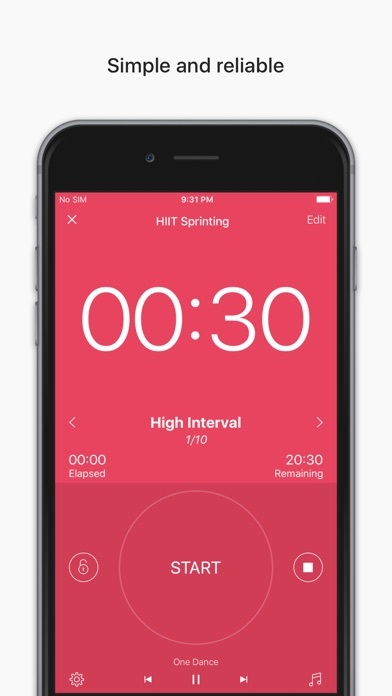 Great application for workouts - interval runs, speed timing, cardio intervals- really, really cool! I use it for TABATA as well. I LOVE this app! I use it in my workout everyday. It's simple to set up, it never quits unexpectedly, and with it I've been able to create all the workouts that I need to read my fitness goals. Only downside is I can't link it to Spotify. Other than that, this is the best $2 or $3 I've ever spent on exercise "equipment"! Thank you Mr. Cook. When you released the latest IOS upgrade it disabled my Apple music library. This is the third time it happened. As with the two previous ones, I had to troubleshoot it by myself (troubleshooting on line with even the a senior afvisor takes just as long; as my lifetime of 24 hours or more of troubleshooting with such wonderful people – truly wonderful professional – attests they are just as thwarted by the IOS BUGS) for four hours often and on for a week(inc signing in and out of everything). Not the first time this is happened. I think it’s because m each time you release an upgrade, it it wipes out my credit card information. But who knows maybe it was just signing in and of apple tunes. Strange because I have a renewing paid up subscription to Apple Music and it was fully pay for it in before this upgrade. I was so frustrated I bought another subscription for Apple match for $27, Which seems to be a necessary part of re-activating Apple Music. I still cannot get the Apple Music playlists back or the personal playlist I created. When I pull those up there is no music in them. I I don’t just go through this trouble because I pay for Apple Music. I do it because I love it and play it on my phone constantly throughout the day. I assume the Apple wants more subscribers to the service. If so, I humbly suggest, is Aamir Consumer, that you avoid this problem in future upgrades. M To compensate us for this, Please give us a Killswitch to stop our kids from playing games on their screens, which makes my teenagers meltdown. In other words, give me the adult organizers of family share ability to disable all apps used by child members of a family share group to block their use of the phone even altogether, independently of the ineffective such features counting by ones ISPs Comcast, Verizon etc. But I the ISPs would lose the revenue thev generate selling streaming data. In the interest of transparency, would please release the contract terms for the for Syd and the amount of money that you obtain from such agreements.. I would eat my hat if you don’t share in that revenue – directly or indirectly. You may counter that I can simply turn off the Wi-Fi but of course0f course the rub is that the kids can simply turn on their data streaming, when I disable or Wi-Fi router ((which by the way is now built into the ISP cabe modem so I will lose my ability to access Wi-Fi). Perhaps I should write to my senator to ask you to testify before the senate interstate commerce committee, or whichever committee is now raking poor Mr. Zuckerberg over the coals. Thank you so much Mr. Cook, and your shareholders (Remembering that only a tiny fraction of society owns any stock trade it on the market it’s either individually or even through their 401(k) or other institutional accounts. Best regards. Just would like HRM connection you can view while doing HIIT workout. Can't Airdrop your workout templates to others. A few modifications with regard to layout options would enhance the experience, however great at what it was intended to do. I use this app every day. It's the best out there. I also liked the previous version which I bought. You still lose your workouts when you upgrade. Fix that please. Also, please use larger fonts for rep counts in portrait, and bigger control buttons in landscape orientation. I used to measure sets by some number of reps. Now I base my routine on how long it takes to do each set. 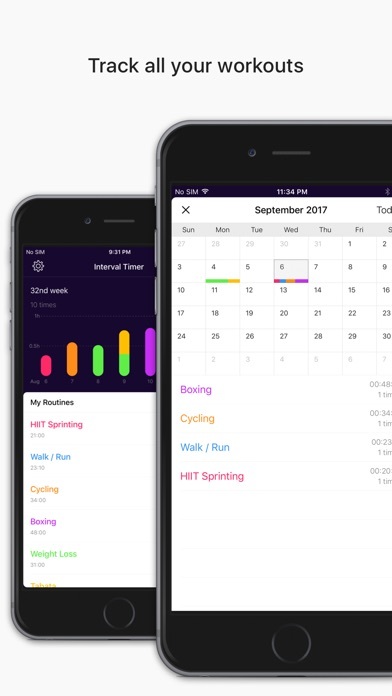 I schedule my entire routine in the app and the app keeps me moving. I know exactly when I will finish and I don’t get distracted between sets. Good changes easy to use. Generally very solid and flexible app. Lacks a few refinements like being able to play shuffled playlists, but overall very good. I find the simple timing routines are plenty flexible for my needs, but that there are more complex things is nice. Excellent workout app. I use it to customize my warrior Xfit workout as well as rounds for kickboxing. Very easy to make routines and add sounds. This app does ONE thing really well. Kudos to keeping it simple, clean and smart. Performs exactly as advertised! Have used for close to 6 years for walk/run marathon training. Well worth the price! What’s different with the upgrade? I purchased the upgrade thinking it would give me more options, but there isn’t anything different between the free version and paid version as far as I can tell. What a rip-off. Interval Timer Pro does just what I want, without a lot of distracting, hard-to-understand extras. Getting the PRO version is a waste of time. There’s nothing “defining” or “groundbreaking” to make you pay $3 for the exact same features. Certain sounds were removed so you’re actually getting less. I’m a PE teacher and workout regularly. I use this app all the time. It’s great. Perfect for physical therapy exercises. Works great for physical therapy exercises. Counts out the reps and the 'hold' time for each exercise. This is a great app. I can customize for stretch time, workout time, and intervals in-between to relax and recover. Works just fine for intervals & jumps- Get on your bike and ride! I’ve used the free and the paid versions for over a year. I really like this app for its feature and flexibility for my workouts. Still waiting for compatibility issues. I submitted a bug report about the free version and paid versions not being compatible. Nothing has apparently been done about it yet. I would still recommend using the free version, because that’s what I am forced to do at the moment. Considering, I created a number of workout routines, before deciding to purchase the full version, and there is no way to transfer them over. Use it for a variety of classes. Easy to use and follow. I have both this and RoundTimer app, which the latter has not been updated for iOS 11. Just downloaded it, and it works great. This app works well. It takes a bit to get the hang of how it works but it is very adaptable and functional when you understand it. 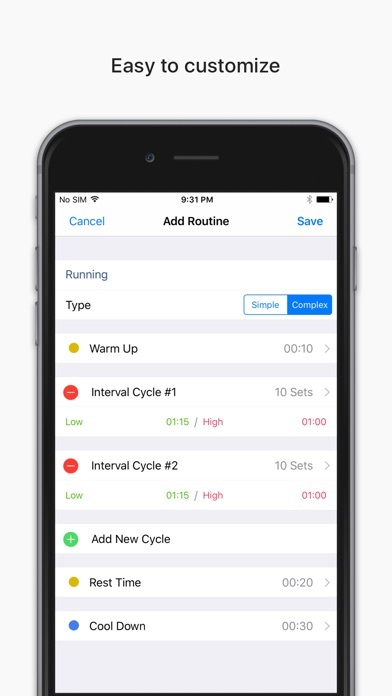 The Pro version is similar to the free but you have the ability to save your interval settings for individual workouts. I use IntervalTimer every day and it does what I need. I've been using this app since 2012 as a workout timer and have loved it. I decided to buy the paid version because I appreciate what this does. I use it for my workout times to increase efficiency by making intervals of work and rest time during weight training. I will now be using additionally to facilitate the Pomodoro Technique. I think this app has the best features and flexibility of multiple timers I have checked. Use it daily for workouts during my lunch or breaks. Just would like HRM connection you can view while doing workout. Can't Airdrop your workout templates to others. Works great for my use, love the music integration. Needs ability to share workouts. I used the free version to test before buying the app and I had to recreate my workouts. Also, I use the app on multiple devices and I can’t share workouts between them. Perfect timer. As simple or as complex as you want it. Works well and helps me stay on pace to improve my run times. A lot to like with lots of options. Would like to see daily times display through the week. The weeks total time is good but not enough. The display is bright and the options for customizing are plentiful. I use it for all my HIIT workouts. I’ve been using this app for a few years and I love it. It has become my go-to for all of my work-outs; whether it’s strength training cross-fit, or mountain biking. It has allowed me to add HIIT to whatever activity I happen to be doing for the day. Works in the background while I use PandoraOne. Wish it could say the number of second remaining every 5, 10, 15, or 30 seconds. It could say ... "60", "55", "50", ... "5", "0". A spoken reverse exponential count would be very helpful. It could say ... "60", "30", "15", "10", "5", "4", "3", "2", "1", "complete"
The interface for saving workouts isn't intuitive, but it's easy once you figure it out. It's also limited to system sounds. It would be nice if it offered a wide variety of sounds. Updating my review. The app has really come back to me since they made sharing optional. (Nothing worse then trying to get in a workout rhythm and clicking on the share after timer and spending time trying to figure out what went wrong with your app). Aside from a few audio issues one of the best apps I have worked with. Tip for the audio issue. Make sure to have at least one music or sound file on your device. Hit the play at the bottom and then you can correct your devices audio levels as opposed to it trying to change the ringer as default. I love the app, but wish it had a watch companion app. 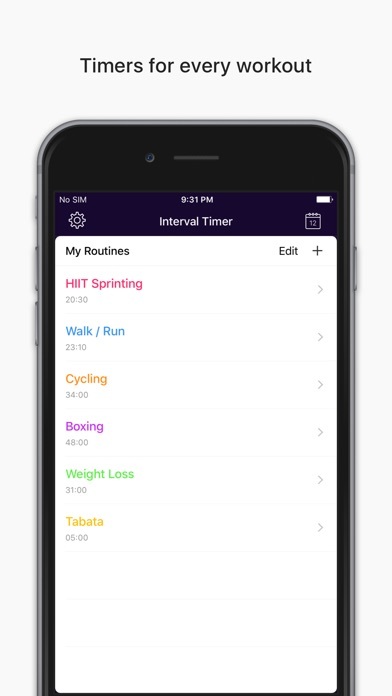 I use this app for helping me get exercise intervals in between hours of sitting at my computer - 30min sitting/3min exercising. Helps a lot. Been looking for an app to train to run. All the apps start out fine but then jump the run/walk intervals way too fast. I create a run sequence that pushes me and then up the run time by 5 or 10 seconds and reduce the walk time same way. Perfect training tool. LOVE this tool. I love the way I can set this app up to give me the intervals I need. I can have multiple programs to fit my mood or fitness. Well done. Great app and amazing company! Excellent app for routine. The company is great. They responded quickly for requests and fixed problems immediately. Amazing!! Wish it could do three sequenced intervals...not just two. Otherwise it's great! My go to app to customize my workouts and not worry about timing as it does it all for me. Plus Love the calendar function which allows me see the types of workouts I do. I couldn’t be more happier with this fitness timer. Handles music and playlists flawlessly. Highly recommend. Love using this all but the latest update is pretty sloppy. Any music that is playing is turned down through the entire workout and not just when the timer beeps. Workouts are different colors in the list with no apparent reason. Use this everyday and developer makes improvements regularly. Excellent. Great improvements over previous version, which was very good to start with. It would be better if there was a way to add any new IntervalTimer in the middle of a sequence. I use this app every day. It's the best out there. I also liked the previous version which I bought. I finally "upgraded" to the paid version of the new app and am disappointed. It simply loaded a new app without migrating my workouts. That'll be a pain for me. I wish I could get an ready refund and stay with the free version. I use this for an exercise program and I found it very convenient and easy to use without any problems. Works well, have been using for several years. Updates keep coming and keep it up with latest phones. Great app, I have been using it for years as a clock chime to count off time while I am working. I tend to focus too much and lose track of time. This app gently reminds me how much time I have left without interrupting the flow state. Gently is the key word. There only 1-2 sounds I can use, the rest are too jarring. And the trouble is I need to change the sounds periodically, because after a while I stop noticing them if I am too deep in thought. WOULD YOU KINDLY ADD MORE SOUNDS, which would be SHORT and PLEASANT. Or connect system own sounds. Thank you very much for considering. Wonderful app,otherwise, I use every day for several hours. Been using this at the gym for years. Works fantastic! Worth the money over free ones.